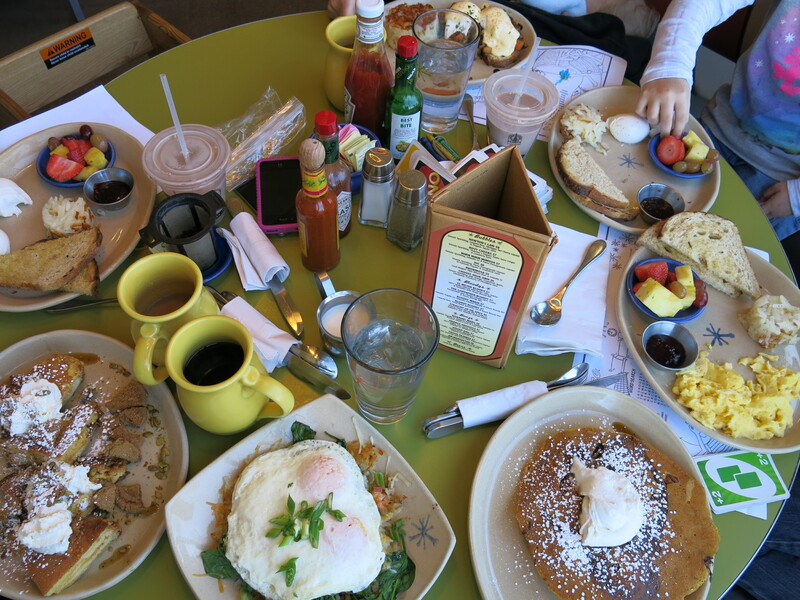 There might be a lot of places to get eggs and pancakes in Denver but for most Denverians (Denverites? ), Snooze has the best breakfast in town. With french toast specials, bright yellow tables and an atmosphere of comfortable chaos, I have to agree. It’s a wait to get in but it’s worth it and once you’re seated the service is cheerful and prompt and the food comes fast. Pictured above is the Spuds Deluxe (hash browns covered with cheese, scallions, veggies and meat topped with an egg), the french toast special covered with crushed ginger snap cookies and some whipped cream and several kids meals. The Uno cards come separate. City O’ City‘s got you covered. 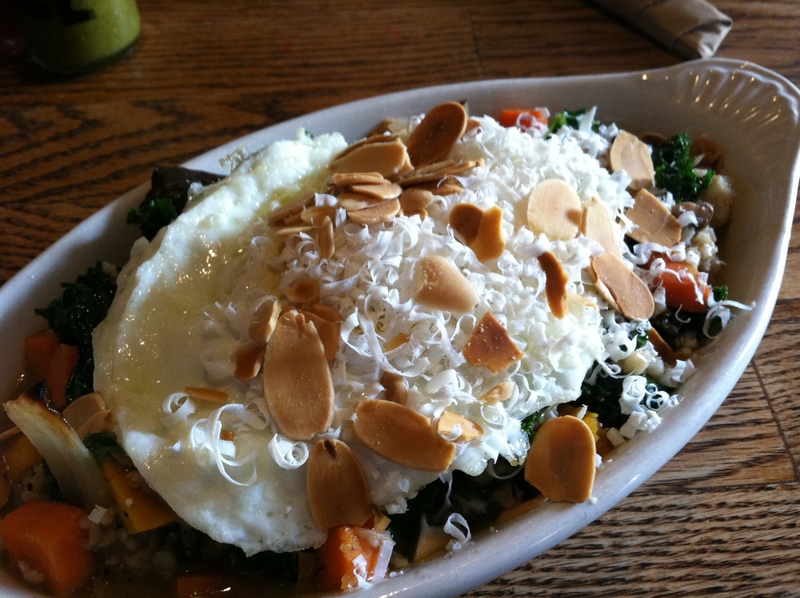 It’s the only place I’ve ever seen savory oatmeal, which was exactly what it sounds: oatmeal and grilled veggies topped with an egg, shredded cheese and toasted almonds. And pretty delicious. City O’ City is a bar/cafe/restaurant and while the service is a bit dismissive, the space is beautiful and the food is good. Or perhaps you want breakfast at 2AM or 3PM? 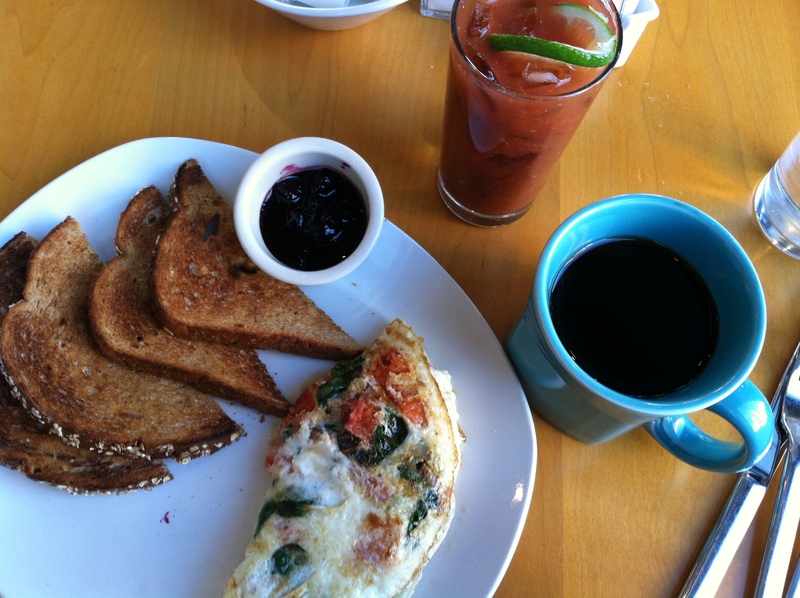 As the name suggests, Tom’s Urban 24 is open 24 hours a day and serves breakfast all 24 hours. The decor resembles the upbeat 50’s retro look of Snooze but slightly less cheerful. However, if you’re coming in at 2AM, chances are good you aren’t coming for the service… I wouldn’t cross town to get here but between Sam’s #3 Diner and this place, no one should ever want for breakfast at any hour of the day in downtown Denver. 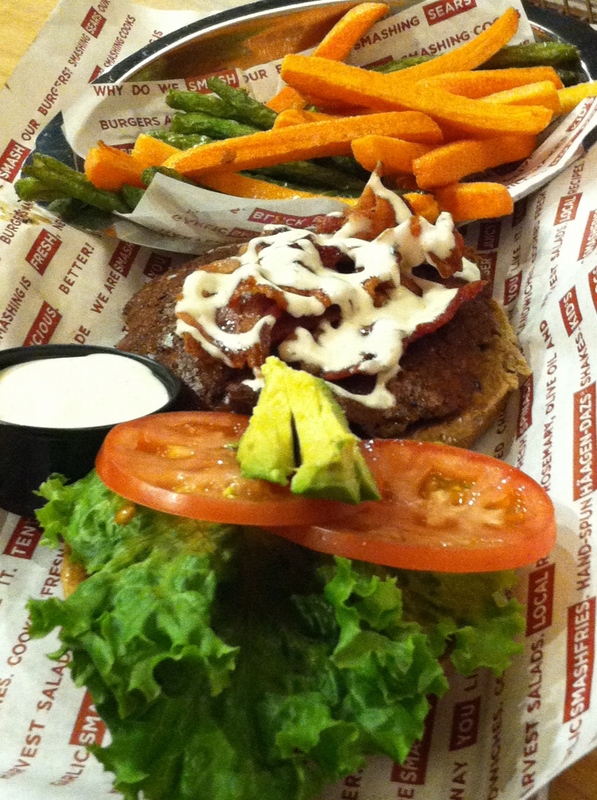 It’s quick and it’s fresh, it’s SmashBurger. Burgers several different ways with a choice of sides (veggie fries were delish) and beer pairings. That’s it. But that’s enough. There are a lot of good dinner options but I’m going to recommend Euclid Hall. 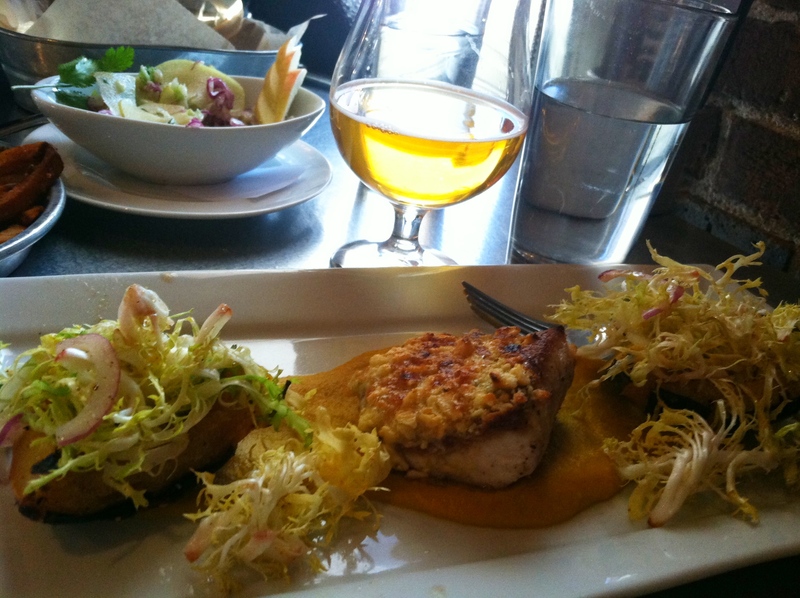 A classy beer hall where they have house brews and really good food, Euclid Hall is great for lunch or dinner. Or maybe you come for lunch and then just have a few more beers and stay for dinner? It’s cozy with all that dark wood and windows. I wouldn’t judge you if you decided to spend an afternoon that way. I might even join you. Still up and about and want to see a few more places? Ok then. How about Green Russell? Yeah, that says Pie. 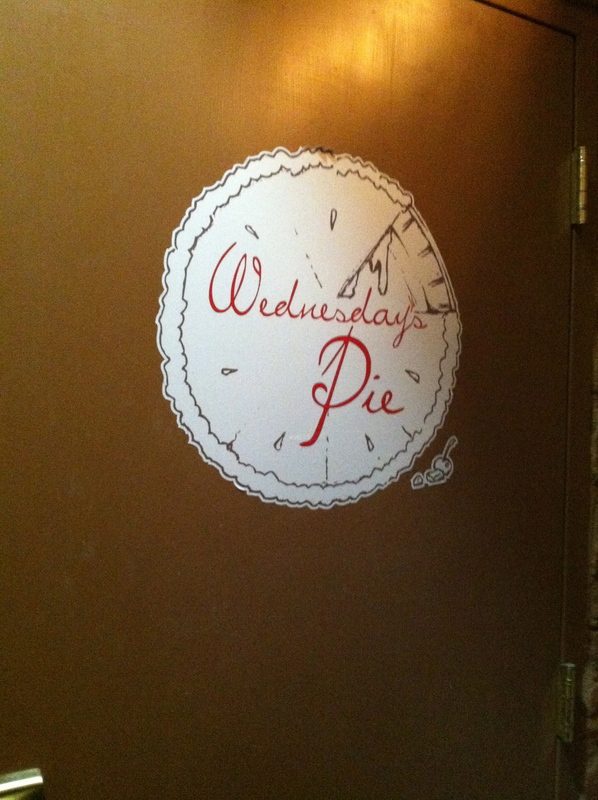 But it’s not a pie shop, it’s a speakeasy. You’ll have to make reservations in advance to get in and then find the very un-obvious doorway and endure the hostess scrutiny but once in, you’ll love it. Green Russell has a beautiful bar with bartenders who will custom blend a drink just for you based on your tastes (um… whiskey… a little bit smoky… slightly sour… perhaps some citrus?) and loads of late night food. I’d highly recommend getting the absinthe service that comes in a big glass jar with silver decanting spigots because it enhances the 1920’s prohibition feel of the place. This bar is perfect for a small group of friends and it’s a great ending to any evening out. 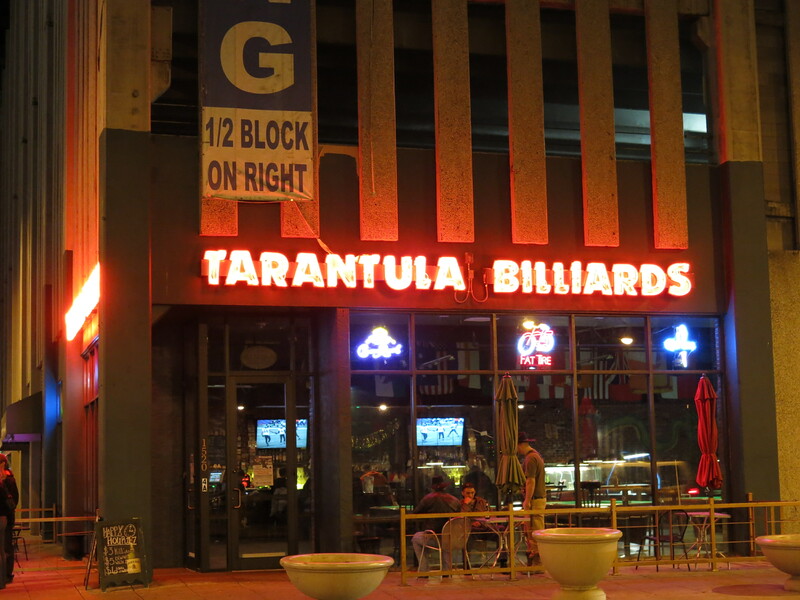 But if you aren’t done quite yet, wander over to the Tarantula. Sticky floors, dim lights, pool tables, cheesy fries and an industry discount for stagehands. If you love any of these things, you’ll love this place. 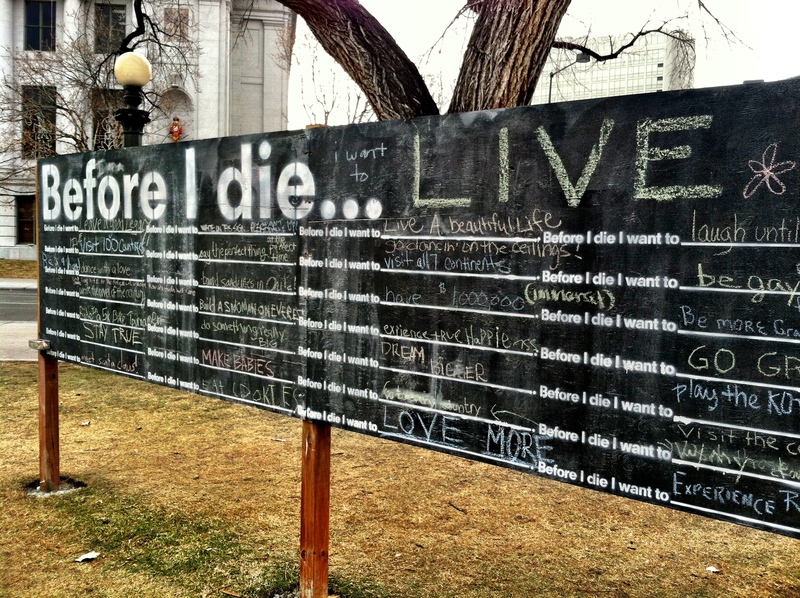 Get out and walk around Denver a little. The public art is as great the restaurants. This entry was posted in Breakfast, Burgers, Colorado, Denver, Eating, Good eating, Vegetarian Food and tagged City O' City, Colorado, Denver, Euclid Hall, Green Russell, i LOVE breakfast, SmashBurger, Snooze, Tarantula, Tom's Urban 24. Bookmark the permalink.